With Valley Of The Damned the British sextet took the first step into the public eye. Now about a year later they are back with Sonic Firestorm. Most obvious is that the songs got faster. They open their album with My Spirit Will Go On which shows that par excellence. A fast melodic tune. A twin guitar blast and fast double-bass drumming is what makes the sound of DragonForce different. This kind of guitar riffing is more common in fast death metal then in power metal. But the melodic vocals and the arrangements are power metal-like. The songs are between 5:10 and 9:46 minutes long. But the six-pack is able to keep it interesting through breaks and tempi-changes, they are still quiet fast, even when they slow down a little. 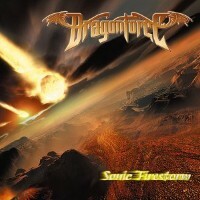 A good one to get an idea about DragonForce is Fury Of The Storm. In comparison with bands like Stratovarius and Rhapsody they are faster and less symphonic / epic then the mentioned. The longest tune of the album is Soldiers Of The Wasteland. It starts with some a cappella lines, then they start straight away. This one partly remind me of some Irish folk... Only the vibe of some parts... But it's really heavy and definitely metal! Their fans call their style extreme power metal and I think that really fits. It's hard to give an idea about their music, so I can just recommend to listen to a song or two. Dawn Over A New World starts with keyboard got joined by acoustic guitar and vocals, later the band joins in. This one is a balladesque, powerful tune. Not really a ballad, but as close as DragonForce gets to a ballad. Actually the only song which isn't up-tempo. A catchy one, shows a different side of the British. It gives a kind of break for the listener just to blow the listener away straight after this one. The British quintet first released an EP through MP3.com and were quite successful. 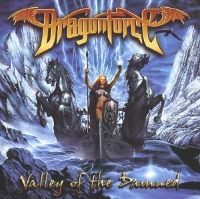 The power metal band DragonForce - formerly DragonHeart - was top of the MP3.com metal charts for weeks, months... Musically they are somewhere between HammerFall, Gamma Ray / old Helloween and other power metal acts, but the band of guitarist Herman Li isn't just another copycat! The title track is a powerful, catchy metal hymn and a good example for the musical direction. Most tracks are up-tempo ones. The rhythm section builds the foundation for screaming guitarists and the vocals of ZP. On Black Fire the band partly slows down just a little and the break leads into an interesting part with an unusual instrumental part, but always sticks to the chosen path. The songs are catchy, but don't get boring after a few spins. Black Winter Night is a good example that the five are able to write fast power metal tunes which have all the essentials, but are also go different ways. Starfire gives the first break with a balladesque track in the fireworks of fast power metal tunes. The sound of falling rain and a piano kicks off the song, then ZP adds the words and remind me of some old 80's glam metal band like Warrant. Don't worry, this is a powerful tune which just uses an element of the pasts sound. And with Disciples Of Babylon they return to the fast power metal. Soon you will understand why this band was top of the MP3.com metal charts. The British quintet will try to conquer the power metal throne and give the established bands a hard time! If they can convince the metal fans live, they will soon be part of the premier league! Buy the album and when they are on tour - I hope they will play live - go to see them!